The estate version of the European Car of the Year 2014 has had some major refinements in 2017. With modern technology fitted, a better and more efficient range of engines and a large range of safety, comfort and automated parking features, the New Peugeot 308 SW brings an enviable number of features to a modern-day estate. Fitted with five doors, a huge amount of loadspace along with the Peugeot i-Cockpit for a clutter-free dashboard and heads-up driving. Apple CarPlay, MirrorLink and Android Auto: your phone seamlessly connects to New Peugeot 308 SW for easier hands-free navigation, calling, music streaming. You can even use Siri (or your own digital assistant) by pressing a button on the steering wheel. Ultrasonic sensors on the side of the vehicle offer a slicker parking experience. The new Peugeot 308 SW measures the space to see if it can fit, will let you know and fully control the steering whilst you manage the acceleration, brakes, gears and clutch. Parallel parking needn’t be a struggle with Park Assist. The new Peugeot 308 SW monitors the road ahead and if it notices a potential collision ahead, it will notify the driver. If the braking is not applied immediately then the vehicle will come to a safe stop to avoid collisions. This will happen at between 5kph and 140kph (when a moving vehicle is detected). Under 80km/h when a stopped vehicle is detected. Under 60km/h when a pedestrian is detected. New Peugeot 308 SW actively monitors the driver to ensure you are concentrating on the road ahead. If the vehicle notices you haven’t stopped for two hours, a warning will appear. If the new 308 SW notices you wandering out of lane (without indicating), the vehicle will warn you. A 180° rear video camera offers a unique 360° overhead view of your vehicle when parking. See the angle that you may think impossible in the new 308 SW and be assured that you are safe from obstacles when parking. With an even better range of engines and transmission options on the new Peugeot 308 SW, customers may feel overwhelmed with choice. 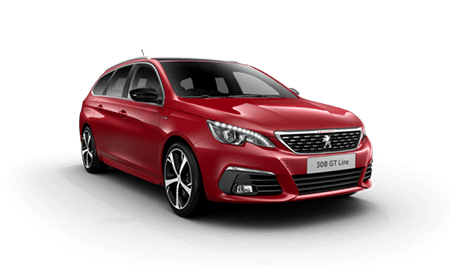 New 308 SW comes with the option of an extremely efficient 8-speed EAT8 automatic gearbox for the smoothest gear changes you’ve ever experienced. The award-winning PureTech range has been refined with the new PureTech 130 S&S BVM6: giving both performance and consumption improvements. This engine is now Euro 6.c compliant (a future industry-standard for road efficiency). The BlueHDi diesel range has also been improved with the BlueHDi 130 S&S. Coming with additional horsepower and a clever emission-control system to ensure it complies with future standards. Drivers will always receive the best economy combined with the best power. Choose the GT trim level and you’ll be given the option of the BlueHDi 180 S&S diesel with the new generation EAT8 automatic transmission. You’ll experience comfortable gear changes at all speeds, coupled with a powerful engine to ensure you never get caught short.